Women are always in search for the new and stylish haircuts, styles and maintaining a perfect glamorous appeal with their hair styles. But unfortunately the curly hair acts as the biggest hurdle in the hair styling of the women and the girls as well. The styling of curly hair for the women specifically is a topic which is discussed frequently by the hair specialists and on various forums. Today the main focus of our discussion is the main confronted by the women due to curly hair and the solutions to those problems. It is a fact that a very huge majority of the women population is facing this problem and is spending a huge amount of money on the hair care and straightening products. But naturally treating the curly hair problem is the only sensible solution and it is effective as well. Here come the main curly hair problems which are faced by the women, girls and pre-teens in their daily lifestyles. If you possess a curly texture of the hair, then probably you would fear of washing our hair frequently because after washing and managing the curly long hair is something most irritating task of the world. If someone fall asleep juts after washing the curly hair then get ready for something really very hectic to happen because the hair would probably be dried into different dimensions making them difficult to tie. If you have curly hair then unfortunately the front bangs are mot something meant for you. If your hairdresser has mistakenly cut the hair in short length with front bangs then this is the worst thing which has happened to you. Straightening the curly hair is considered as the most frequently used remedy for the women curly hair but, straightening the curly long hair is very time taking and requires a very long time, even several hours. And it’s wastage of precious time. When the women and girls wash their curly hair then they can’t predict that how their hair would look alike after washing. Because the curly hair reacts differently by using different shampoos and conditioners. The teen age girls and socializing women can never make urgent plans of hangouts and social gathering because it would take several hours for proper managing and styling of their hair. The process of how to make wavy hair by applying different products and lotions is also time taking. The girls and women with long curly hair have to use certain type of clips, big catchers and similar accessories to manage their frizzy and bumpy hair. Such accessories may be costly and don’t even provide the required results. The same thing happen when the girls and women frequently purchase imported hair straightening serums and lotions but they never lasts for more than a week. It’s very unfortunate for them. The teen age girls and the women can never wear several styles of funky bandanas and caps with curly hair because the bandanas and the caps or hats can flatten the texture of the hair. Women with long curly hair also face difficulty in selecting the right kind of hair cut which can reduce the intensity of their curls and make them elegant to look. The professional hair styling services may be sometimes too expensive for the women or college going girls. Wearing the little, rich colored and elegant earnings are useless for the women because such accessories can’t be seen by the other individuals due to the big and dense curly hair. 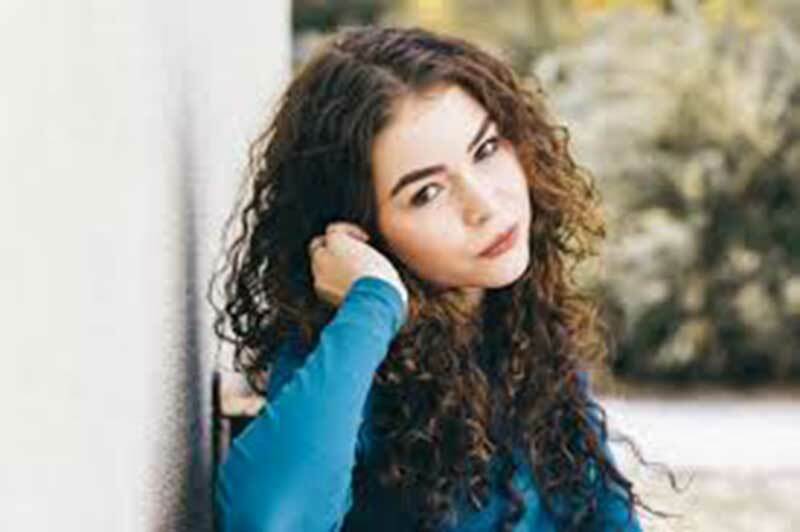 Several other problems like going and meeting with the new guys are confronted by the women with curly hair because they feel shy and confused because they are never confident about their looks. The women curly hair can surely be dealt by the proper care ad using the natural products. The curly hair can be managed by applying certain steps in the valid manner. Now, we are going to mention some tips or solutions with the help of which, the women can solve their curly hair problems. The curly women hair should be dealt with due care and efficiency. Never leave your hair as what they are. Proper care and regular conditioning is essential for protecting the curly hairs. The proper hydration of the curly hair makes them easily manageable. The styling of curly hair also becomes quite easy by applying the high quality conditioners. The application of authentic conditioners will provide a gentle soft touch to the curly hair and the women can straight them easily. The right haircut or styling of the curly hair is very essential. Yes, the women can consult a professional hairstylist and can discuss their hair texture and problem with them. Generally extremely short or long hair is not suggested to the women who have curly hair. The extremely short hair cut would be hard to manage and extremely long length of the curly hair is also difficult to straight and managed. It is a fact that curly hair has more quantity of protein in them and less moisture. In this condition, the curly hair is basically thirst for moisture. Keep them hydrated ad moisture. The question of how to create wavy hair is often asked by the women with curly hair because they regard slightly wavy hair more desirable as compared to the densely curly and coiled hair. They can use the blow dry for this purpose. Excessive blow dry is not suggested. If the women and girls want to enjoy the rain outside or a dive in the ocean then they can apply some conditioner on their curly hair, it will make them under control even after going in the rain or in the sea. The same thing can be done before and after taking the bath. Using oil to control the frizzy hair is not good for the women with curly hair. They can use the oil application or massage just twice in a month not more than this. Because the excessive use of oiling can create problems for curly hair. When the women with curly hair are trying to style their hair, then they can portion their hair into 4 to 5 sections. The division of hair sections will help the women to manage their curly bumpy hair in an effective way. -What happens when you brush it? -How do people cut your hair? -Have you ever straightened it? -How long does it take to straighten? Can you please suggest some natural remedies to Straighten my Hair? Can you suggest a product that gives surf hair relaxed curl without frizzing? For rough curly hairs with split ends suggest me some ways to smooth it..